This is the kind of love story that does not reach out to me. I found it boring and everything else that I dislike about annoying teenage relationships. It wasn't bad. I actually really liked it at first, especially the voiceless communication between Eleanor and Park. The unsaid words of gratitude that comes with the exchange of comic books and mixed tapes, and the six inches of space between thew was fun while it lasted. But when they started to talk more, it just did not do anything good to me. It was like an instant unofficial relationship. Then, from no good, it went a bit worse. The relationship was unstable, confusing, and complicated. It wasn't funny, or sweet, or romantic. It was plain and bland. I would love to love the story, but it didn't suit my taste. 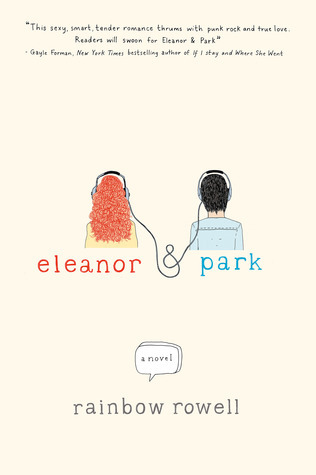 I usually love unusual characters, like Eleanor and Park. They weren't the best looking people, they weren't popular, and they weren't exceptionally talented. They stood out the best way they can, and that's by being awkward. I liked that, but sometimes they just seem to be off and that irritated a bit. Again, I liked it at first. I am starting to get used to dual point of views now, and the book was good with that. I loved the parts when Eleanor and Park constantly switched point of views (not 1st person, but 3rd person) with only a short lines to tell. That was the meaningful part for me. Too bad that a big part of the book wasn't that great. But there were still a few notable good parts. Well, 2.5 stars.